Dr. Sutton grew up in Dallas, TX and attended college at UNC Chapel Hill, where he graduated With Distinction with a Bachelor of Arts in Biology and Philosophy. He attended medical school at UNC Chapel Hill, where he graduated With Distinction at the top of his class. 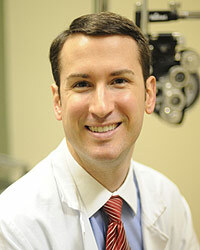 He did his medical internship in Memphis, TN, and returned to UNC for his medical and surgical ophthalmology residency. Dr. Sutton moved to Wilmington several years ago to join his wife, Dr. Holly Shaffer, who is a dermatologist at Dermatology Associates, P.A. After several years practicing in Wilmington, Dr. Sutton became aware of a shortage of ophthalmology eye care in Columbus County. As a result, he decided to move his practice to Whiteville, where he could provide much needed eye care to the people of Columbus County. Dr. Sutton is a nationally award-winning cataract surgeon, and has also devoted extensive research time to helping find new treatments in preventing blindness in babies born prematurely.